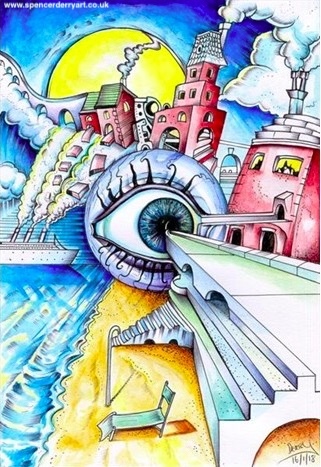 Buy On The Beach on ArtGallery - Original Hand Drawn Surrealistic Art Illustration, Created By UK Artist Spencer J. Derry. This Original Surreal Artwork Colour Version Was Created In 2018. Media: Felt Pen and Acrylic Wash on Paper. Secure P+P Worldwide tracked or signed for. Original artwork with signed Certificate of Authenticity W 8.26" x H 11.69" Media: acrylic and felt pen Surface: 200 gsm white paper, Note NOT framed.